↑ 1,0 1,1 1,2 1,3 1,4 Hadžiselimović R, Pojskić N (2005). Uvod u humanu imunogenetiku. Sarajevo: Institut za genetičko inženjerstvo i biotehnologiju (INGEB). ISBN 9958-9344-3-4. ^ McClory, Susan; Hughes, Tiffany; Freud, Aharon G.; Briercheck, Edward L.; Martin, Chelsea; Trimboli, Anthony J.; Yu, Jianhua; Zhang, Xiaoli; Leone, Gustavo (2012). „Evidence for a stepwise program of extrathymic T cell development within the human tonsil”. The Journal of Clinical Investigation. 122 (4): 1403—1415. ISSN 1558-8238. PMC 3314444  . PMID 22378041. doi:10.1172/JCI46125. ^ Vantourout, Pierre; Hayday, Adrian (2013). 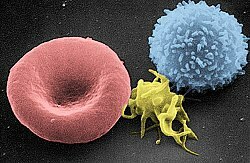 „Six-of-the-best: unique contributions of γδ T cells to immunology”. Nature Reviews. Immunology. 13 (2): 88—100. ISSN 1474-1741. PMC 3951794  . PMID 23348415. doi:10.1038/nri3384. ^ Akbar AN, Terry L, Timms A, Beverley PC, Janossy G (1988). „Loss of CD45R and gain of UCHL1 reactivity is a feature of primed T cells”. J. Immunol. 140 (7): 2171—8. PMID 2965180. ^ Willinger T, Freeman T, Hasegawa H, McMichael AJ, Callan MF (2005). „Molecular signatures distinguish human central memory from effector memory CD8 T cell subsets.”. Journal of Immunology. 175 (9): 5895—903. PMID 16237082. doi:10.4049/jimmunol.175.9.5895. ^ Shin, Haina; Iwasaki, Akiko (2013-09-01). „Tissue-resident memory T cells”. Immunological Reviews. 255 (1): 165—181. ISSN 1600-065X. PMC 3748618  . PMID 23947354. doi:10.1111/imr.12087. ^ Abbas AK, Benoist C, Bluestone JA, Campbell DJ, Ghosh S, Hori S, Jiang S, Kuchroo VK, Mathis D, Roncarolo MG, Rudensky A, Sakaguchi S, Shevach EM, Vignali DA, Ziegler SF (2013). „Regulatory T cells: recommendations to simplify the nomenclature”. Nat. Immunol. 14 (4): 307—8. PMID 23507634. doi:10.1038/ni.2554. ^ Singh B, Schwartz JA, Sandrock C, Bellemore SM, Nikoopour E (2013). „Modulation of autoimmune diseases by interleukin (IL)-17 producing regulatory T helper (Th17) cells”. Indian J. Med. Res. 138 (5): 591—4. PMC 3928692  . PMID 24434314. ^ Serriari NE, Eoche M, Lamotte L, Lion J, Fumery M, Marcelo P, Chatelain D, Barre A, Nguyen-Khac E, Lantz O, Dupas JL, Treiner E (2014). „Innate mucosal-associated invariant T (MAIT) cells are activated in inflammatory bowel diseases”. Clin. Exp. Immunol. 176: 266—74. PMC 3992039  . PMID 24450998. doi:10.1111/cei.12277. ^ Kjer-Nielsen L, Patel O, Corbett AJ, Le Nours J, Meehan B, Liu L, Bhati M, Chen Z, Kostenko L, Reantragoon R, Williamson NA, Purcell AW, Dudek NL, McConville MJ, O'Hair RA, Khairallah GN, Godfrey DI, Fairlie DP, Rossjohn J, McCluskey J (2012). „MR1 presents microbial vitamin B metabolites to MAIT cells”. Nature. 491: 717—23. PMID 23051753. doi:10.1038/nature11605. ↑ 15,0 15,1 Schumann, Kathrin; Lin, Steven; Boyer, Eric; Simeonov, Dimitre R.; Subramaniam, Meena; Gate, Rachel E.; Haliburton, Genevieve E.; Ye, Chun J.; Bluestone, Jeffrey A. (2015). „Generation of knock-in primary human T cells using Cas9 ribonucleoproteins”. Proceedings of the National Academy of Sciences of the United States of America. 112 (33): 10437—10442. ISSN 1091-6490. PMC 4547290  . PMID 26216948. doi:10.1073/pnas.1512503112. ^ Jones J, Bannister BA, Gillespie SH, ур. (2006). Infection: Microbiology and Management. Wiley-Blackwell. стр. 435. ISBN 1-4051-2665-5. ^ „The Lymphomas” (PDF). The Leukemia & Lymphoma Society. 2006. стр. 2. Архивирано из оригинала (PDF) на датум 06. 07. 2008. Приступљено 2008-04-07. Davies AJ (1993). 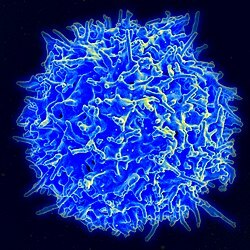 „The tale of T cells”. Immunology Today. 14 (3): 137—139. PMID 8466629. doi:10.1016/0167-5699(93)90216-8. Ова страница је последњи пут уређена на датум 25. август 2018. у 19:30 ч.